Axor and French design star Philippe Starck take the showering experience to whole new dimensions. The 24 x 24 cm overhead showers still feature the square design of the Axor Starck ShowerCollection, on the ceiling and on the wall. They are perfect for smaller showers. The new overhead showers come in three versions: flush with the ceiling, with ceiling connector or for wall mounting with shower arm. A flow limiter enables water consumption to be reduced to 20 l/minute or to 12 l/minute optionally. The wall-mounted gush shower in the 12x12 principle of the collection offers an awesome spa-like experience: A combination of shelf and spout offers the user the ultimate neck massage. The waterfall spout can also be used in the bath tub to produce a serene, wide-ranging waterfall. 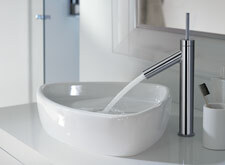 The wash basin mixers in the Axor Starck collection have been expanded to include a model with an intermediate height: the single lever basin mixer 260 is perfectly tailored to the new counter top wash bowls from the Duravit Starck series and is particularly suited to shallow wash bowls. 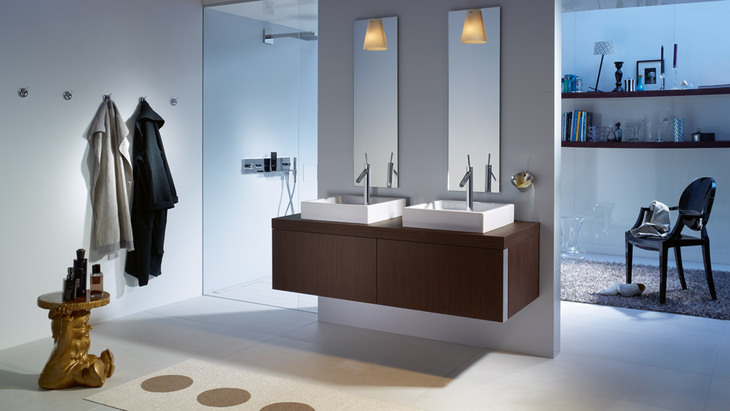 The characteristic Axor Starck design language is the ideal solution for any wash basin scenario. As with the existing Axor Starck mixers, EcoSmart technology is used here: an aerator limits water consumption to five litres per minute. It's hard to imagine a minimalist bathroom without the classic manual shower. Axor Starck now offers a single jet manual shower in high-quality metal design. The Axor Starck ShowerCollection now offers an even better shower experience: new overhead showers in the 12x12 principle of the collection, perfect for smaller showers too. Whether you like massaging your neck with an invigorating shower, or filling up the bath tub waterfall-style: the bath filler in the Axor Starck ShowerCollection is ideal for any requirement, its gush spray guaranteeing perfect water enjoyment. The combination of shelf and spout offers extra practical benefits in the minimalist design language of Philippe Starck. The broad collection of Axor Starck single lever mixers offers you the right mixer for any situation – whether it is to be positioned outside or directly within the basin. From its convenient intermediate height, the new Axor Starck single lever basin mixer 260 always directs its water jet at the right spot, into the counter top wash bowl. The single-jet Axor Starck manual shower, in high-quality metal design, is also available as a shower set. This is perfect for the classically minimalist bathroom. The flow rate is limited to 9 l/min. Do you love shallow wash basins and counter top wash bowls? Natural basins with little room for mixers on the rims? The Axor Starck single lever basin mixer 260 directs its water jet to the perfect position from a convenient height next to the wash bowl. The new intermediate height fits perfectly onto the edge of shallow wash basins.